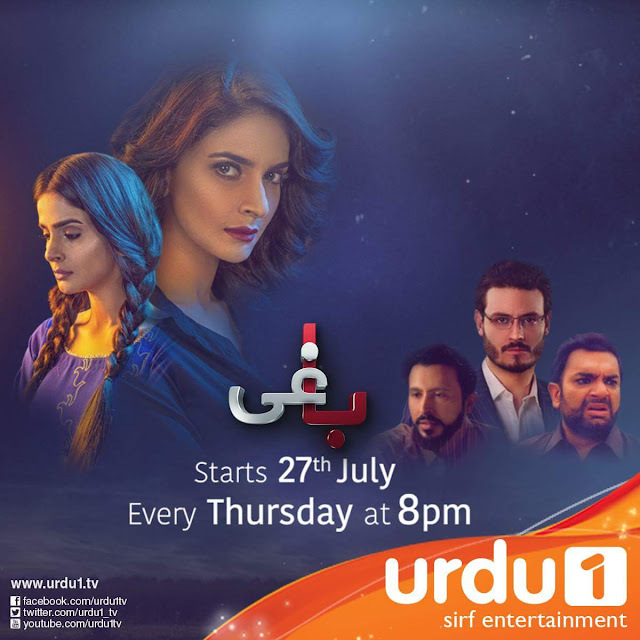 Baaghi is an upcoming drama which will be telecast on Urdu1 Channel. The drama is based on the life of late Internet celebrity Qandeel Baloch, who rose to fame for her sensual selfies and videos in a conservative land. Qandeel was murdered by her brother Waseem Azeem. Her provocative videos and notorious acts were claimed to be the reason for it, bringing the reputation of the family down. Saba Qamar playing the lead role of Qandeel Baloch in this drama. It is a story of a small town girl who had big dreams and ambitions. She was held back by her parents from attaining education and later on she was mistreated by her husband. In pursuit of attaining her goals and supporting her family she moved to the city. She faced many hardships and rejections at every step of the road. Whenever she chose a right path she was deviated to a wrong path. Left with no other option she set out to create a name for herself on social media. Misguided by people, she ended up putting controversial videos on social media to gain attention. However the outcome wasn’t pleasant and she received nationwide criticism. Who knew that criticism would result an unjustified death.